The first ever summit on Asian American stereotypes is being organized by Jeff Yang, of SHATTERED and Wall Street Journal. 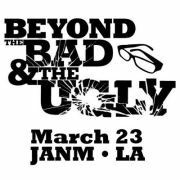 If you’re going to be in the Los Angeles, California area on March 23, take the day to stop by the Japanese American National Museum, which will be hosting the first ever summit on Asian American stereotypes: Beyond the Bad and the Ugly. An all-day series of panels has been organized by Wall Street Journal columnist and SHATTERED co-editor Jeff Yang (@originalspin), and includes some really great guest speakers from across the community. Organized by Jeff Yang, columnist for the Wall Street Journal Online and editor-in-chief of the new graphic novel anthology SHATTERED (http://siun.org/shatteredbook), which uses the medium of the comics to explore and explode unyielding stereotypes of Asians in pop culture, BEYOND THE BAD AND THE UGLY gathers together some of the brightest and most interesting Asian American creators, and critics, activists and academics in a unique one-day summit that begins by looking back at the heritage of Asian images in American media and society, and ends by looking ahead — discussing new ways to prevent distortions and present more vivid, humanized, three-dimensional portraits of Asians and Asian Americans to a wider and more accepting audience. • Keynote Conversation “ORIENTATIONS”, a three-way talk about the history of stereotypes of the “far” and “middle” East, between Professor John Kuo Wei Tchen of New York University’s A/P/A Institute; science fiction author and cultural studies scholar William F. Wu; and Jack Shaheen, author of REEL BAD ARABS, former CBS news consultant on Middle East affairs and Professor Emeritus of Mass Communications, Southern Illinois University at Edwardsville. • Closing Plenary “CHANGING THE GAME,” a conversation about reevaluation and reinvention of stereotypes, moderated by Oliver Wang, cultural critic and Assistant Professor of Sociology at CSU-Long Beach, and featuring Parry Shen (star of BETTER LUCK TOMORROW and SHATTERED managing editor); Christopher Chen, producer of the forthcoming documentary LINSANITY; Jay Caspian Kang, Grantland editor and author, THE DEAD DO NOT IMPROVE; Brian Hu, managing editor, Asia Pacific Arts magazine; and other special guests to be announced. For more information on BEYOND THE BAD AND THE UGLY, or to connect with participants for interviews, email organizer Jeff Yang at jeff@secretidentities.org. BEYOND THE BAD AND THE UGLY will also officially kick off SHATTERED’s 2013 book tour, which will take Yang and his co-editors Parry Shen, Keith Chow and Jerry Ma to select cities and college campuses in the East, West and Midwest. For further information on booking the SHATTERED tour, contact Keith Chow at keith@secretidentities.org, or complete the SHATTERED booking form at http://siun.org/shatteredtour. IS THIS STEREOTYPE REALLY NECESSARY? You need to check it out. More information forthcoming at the event’s Facebook page. Next Next post: The problem with the Genetically Modified Food controversy is that it lacks a basic grounding in science.